Three Years Blogged + a Linkup! Walk, Run, Walk, Laugh, Repeat. Every morning after Sebastian has risen at some ungodly hour of the early morning slash basically still nighttime he has a little ritual that makes perfect sense. He devours his instant oatmeal, checks if Julia and Theo are awake (never -- because they are 100% human and not 80% vamp like he is), tells me to "shhhhhhhhhhhh" because they are still asleep, and then goes and puts on his rain boots. Or Julia's rain boots. Or one of his and one of Julia's - whatever combination he knows will make her the most angry and spit her usual morning dragon breath because Bash loves a good show. The kids love their boots or their "boooooooooooooo" as Bash enunciates so smartly and Simon even didn't argue too much when I asked that he not tuck the boots under his pants (?). Vant un pair? I thought so. Joules is giving away a pair to one lucky reader (any pair! girls, boys, mens, or womens!) ... don't tell me you don't love these. Don't - because they are my favorite in a size 8. Just Rafflecopter your way to victory and many thanks to Joules for being so kind! Well, I was dying for a pair of the Evedon ones, so I finally bought a pair of red ones as my "goodbye England" gift to myself before we moved back. But while the printed wellies (in the beagles or the navy stripes) have always turned my head, I think I'd go for classic bright yellow in the posh wellies- what's more classic than yellow wellies?!? Oh those are so cute! I love the flowered ones. Um... yes please. I have never had a pair and always wanted one! I love the yellow ones. So I can look like the Morton Salt Girl! I love the flower patterned ones! I love the little kids' boots so much! So hard to choose a fave, but I have to go with the classic navy stripe. I love the Milly boots with the big pink bows on them! I'm supposed to pick just ONE pair?!!?!?!?! Impossible giveaway - but I'm in. The women's pair with the little foxes on them — so cute! Love the Posh black ones or the navy stripe! Yay yay for British wellies (from a Brit)!. I would love the women's spotted wellies, or the blue glossy ones if I were brave. um the striped ones are slaying me! love love love. Pink Spot...I think. they're all cute! I really love the posh welly in pink but I think black would be more practical. Thanks for the opportunity! The kiddo ones are my fave! I think I like the women's Womens Rain Boot, Navy Spot - or the navy stripes... because Paul will just out grow his...right? haha. I love the flowered ones. My daughter needs floral rain boots! Love the florals! They are just darling! You know I want these. The navy polka dots are calling to me- especially since it's been pouring buckets here all the live long weekend. Fingers crossed! Hydrangeas and rain boots...so picturesque! I saw the brown dog boots and about died. Love the posh yellow ones! I'm moving to Washington. I neeeeed a pair to assuage the rainy day blues! And I'm totally outfitting the whole family in cheerful yellow. I want those pink ones you linked to! I love the navy stripe weekli! I like the pink spot or navy stripe pairs! So cute! I hope in some way, shape or form, the fact that Simon was willing to grace us with an outfit post brings a golf sponsored give away to the Camp. navy polka dot, of course! Either the posh wellies in pink or the black millie wellies! So cute! Do I need rainboots? ....No. But do I WANT rainboots? Obviously I need to be twinners with Bash. I like the navy floral printed ones. Thanks for hosting! Ooh! I could really use these in our new back yard! Ummm yes please. I would love rainboots. I love the Womens Rain Boot, Navflor! So pretty. The womens hot pink or the pink with white polka dots are probably my faves. So super cute!! I love the floral print ones! Welly Print Navy Multi. so cute. Even though I never win these things....! Moving forward, I think Simon ought to just be referred to as St. Simon. Aaron would KILL ME if I ever tried to get him into a pair of rain boots. I'm impressed that he was a willing and smiling (!!) subject. These are so adorable! Love the pink stripe!! Oh my! I love all of the choices. Could definitely use them this summer in the rainy Midwest! Boy truck boots. They'd die. Love the boots. Any pair would be great! I love the blue and white striped boys boots with red soles! HOW SWEET are these pictures? striped, polka dotted, bright yellow.... I would probably be happy with just about any of them! I am such a sucker for stripes ... especially navy & white! Love them! I would totally wear those hot pink boots. (Although too bad they don't have purple. ;) ) And those scarves are lovely. Ahh so cute! You have a great family! :) Love the boots. your blog is my favorite and i live for you posts. thanks for being hilarious! and thanks for the giveaway! I loveee the womens green posh rain boots! I was considering asking if they carried Julia's boots in women's sizes until I saw the pair you had linked. Amazing. Also, "enthusiasm is my favorite" made me laugh out loud. Love the women's premium rain boots in black! The bow does me in. These are very cute! I think I would selfishly have to pick a pair for myself if I win. That way I wouldn't have to hear my five beautiful children fight because one of them got a super cute pair of rain boots. I have been drooling over their boots for MONTHS!!! ahh! I don't need the boots but I just wanted to comment on my two favorite little people. I want to catch rain with Julia! I love her face...so precious! That's all...have fun with the giveaway! it's a toss up between the junior seafarer boots in blue or yellow... i don't want to pick. they are both really cute! Cute! I love all the striped ones. You can never have too many wellies. Your captions kill me. I love the floral print ones. The boys' rain boots with the green tractors would be perfect for my son to help his daddy with farm chores! I love the POSH Welly-just can't pick a color! Love the posh wellies in navy! DYING over the boots with the fox print. I would give them a good home! I know they'd get hijacked, but I'd love any and every blue pair! Wellies with bows? How did I miss wellies growing up to be so fancy and fun? I would love a pair! My daughter really wants a pair of red rainboots. We were just talking about it today, it's serendipity! But of course! I've always wanted a grown-up pair of rain boots. Because I'm selfish that way and my girls would only fight over who got the gifted boots if I picked a kids' pair. So....you want me to pick just one??!? It's a toss-up between the navy stripe, pink spot and navy dot. Really, it' a toss-up between all of them but I suppose you want me to narrow it down. I love the navy spot ones!! Thanks!! Was just thinking about how I should invest in some boots. But free ones are better. Love the floral print ones! The navy stripe is my favorite. And sebastian looks like simon more and more - so cute! Love the navy w/ polka dots! Even more than I want this pair of boots (size 8, por favor), I want to tell you that the kids are getting simultaneously bigger and cuter at an astronomical rate. Good job, mom! I have wanted the fox ones for so so long!!! 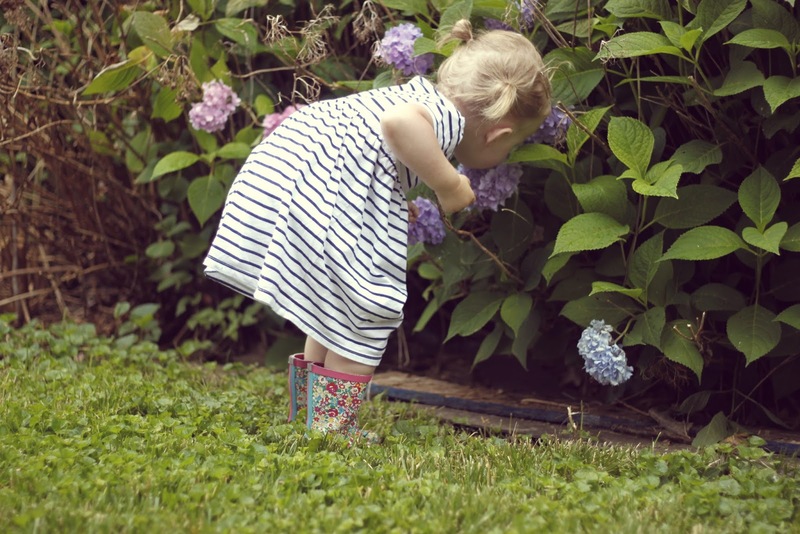 Those floral rainboots are too cute! Hooray for Stripes....navy multi stripe is my fav! I die at the cuteness of the three of them walking away! I love this striped pair! Yellow or stripes? I can't decide! Tweeted about this awesome giveaway! I LOVE Joules wellies! The ones that lace up in the back with ribbon... swoon. That pair with the bow! i die. do they make it in forest green?? Oh my ... too many to choose! 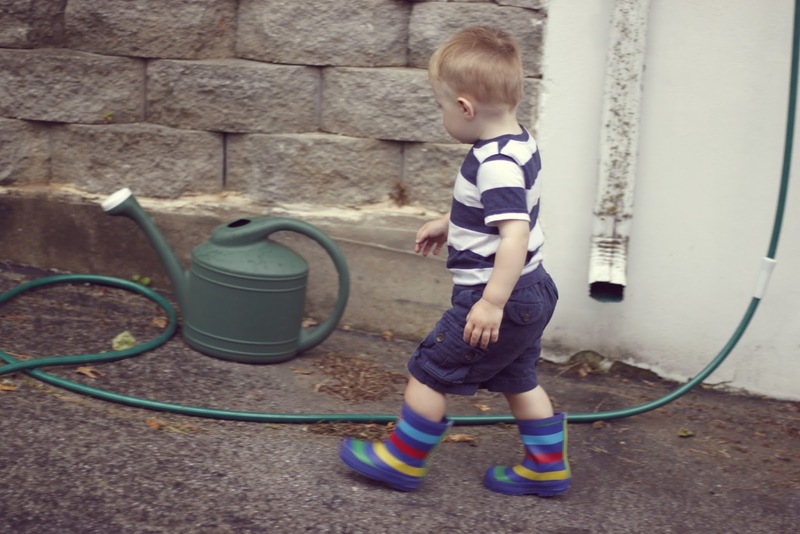 I love the Millie Wellies for myself and the Bluflor Wellies for my little one! Evedon in black for my big ol' feet! I'm a little obsessed with the fox print ones. I have been thinking about rain boots a lot lately and wondering why I don't have any. These look great! Love the yellow ones. So fun! Navy Polka dot ones for sure! The girls striped ones would be super cute for my daughter, but the pink ones that you linked to are cute too! These are so cute! Would love a pair for my little one! Love so many of these...the posh women's wellies are awesome! Loved Simon's debut too! I love these wellies! Would love a pair! I would love a pair!!! They're all so cute I can't decide! But if I had to narrow it down, I'd say either the Welly Print Navy Stripe or the Green Posh Welly. Hmmmmmmm, the classic posh wellie in yellow for me! And maybe the striped for Ryan. Love the pink posh boots! I love the Posh! In pink. Or bright yellow. Or black! oh my. these are lovely. how to choose?? Get this, I live in the Northwest and don't own a pair of rain boots. Crazy, I know! These boots would be totally perfect for this Washington weather we get practically year-round! I wonder if it would rain if I had rain boots. Maybe if they were cute rain boots like these. We really need the rain. I would choose the navy polka dots or the navy striped. Love the pink spot Welly Print! I definitely want to have a pair for myself! The kids get everything fun!!! I truly have been eying the Evedon boots in red for YEARS! it would be so great to win a pair! Love the blue and white polka dot. Love the shark wellies for boys! Slightly embarrassed I only comment on giveaways - but you have great ones and I can't resist. That being said - half the wellies didn't show up on my page, but I'm slightly fascinated with the wellibobs. Not sure if the real-life-me-wearing version would come off very well, but they're more fun than the hunter green plain rain boot I'd probably go for. In LOVE with the red striped pair. And it might actually rain once in a while in North Carolina, right? pink stripe and/or navy multi! love rain boots. need some. Rain boot, Green Fox Welly print! Oh man. So in love with the "Multstr Welly" version. I'm thinking that means "multi-stripe"? I do love them, I do! I'm all over the pink polka dots - rain boots are a little pointless in Arizona, so why not just go all crazy-like and get something loud like them? oh. my. word. I NEED a pair of these! Awesome give-away!! I'm with you on the posh boots! Me me me pick me!....please! My favorite rainboots are the Womens Nautical Rain Boot, Red SEAFARER. love the evadon rain boot!!! I don't even know how to pick, but since I must... the navy polka dot or the floral print are beyond cute. i have been wanting a pair! ooooh I love.. I like the women's nautical! Brown dog print, for sure. 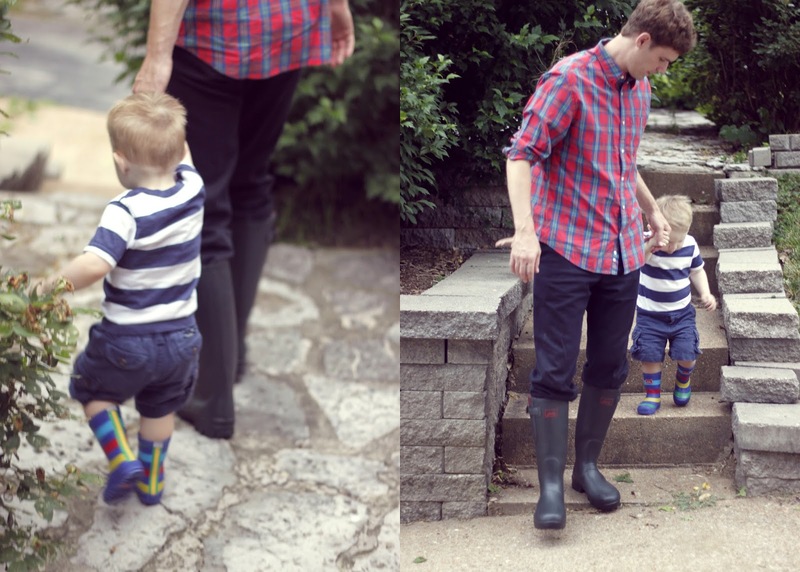 My tree year old needs a new pair of rain boots - in love the jr Wellies b boots in stripes! Super cute Julia! I would take any pair! I love a good pair of wellies. And we sure need them here in Indiana these days! Oh, the navy floral ones are awesome! I'm liking the pink with white polka dots. I'm sure I could make them match everything I own. Soo last fall I bought a pair of wellies but sent them back bc I thought I was allergic but actually I was just getting the coxsackie virus...so yeah, I've def been in the market before hurrican season ramps up. Really diggin' the red and white stripe or floral on black ones. I'm going to have to agree with you on the faves. I saw these about a year ago on Pinterest and I am so pumped that you a) reminded me about them and b) are giving a pair away! Love it! There are too many cute options - I don't know which one to go with! Right now I would go for the Womens Premium Rain Boot in Black (Evedon). I'm smitten with the bow! Yay for Simon getting in on the fun! I'm loving the yellow, green, and the pink! Love love love the Posh in pink you linked. Also love the Welly Print Red Stripe. I would love any of the little boy boots! LOVE the Navy FLoral boots! I want! I need a new pair so badly! I left my last ones in the U.K. with my mother-in-law and told her she could wear them. So she took me at my word and wore them 'til they broke down. :c I was looking forward to picking them up when we last visited, but alas! LOVE the fox print! And the navy floral! The Mollywellies are so cute! meeee! i want some wellies!! Thanks for doing this giveaway! Such a cute one! oh my gosh, i didnt even have to look past the link you posted and i was already in love...i hope i win because my bank account can't even handle those for my next splurge!